Theodor Adorno is widely acknowledged to be one of the twentieth century's most original thinkers. The extraordinary range of his work is matched by the distinctiveness of his central intellectual preoccupations. This new introduction offers a comprehensive and accessible account of Adorno's work. Jarvis discusses the intellectual and institutional contexts for Adorno's thought and, in a broad-ranging study, examines his contributions to social theory, cultural theory, aesthetics and philosophy. He shows how a re-examination of Adorno's work from the perspective of classical German philosophy allows us to see him from a new and illuminating angle, and ultimately to achieve a fuller understanding of all his thought. 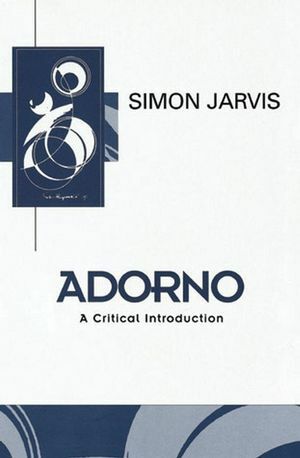 In a clear and detailed account, Jarvis demonstrates the enduring coherence and explanatory power of Adorno's work and illustrates its continuing relevance to contemporary debates. The book will be welcomed by students and researchers in a wide range of disciplines, including sociology, philosophy, literary theory and cultural studies. Simon Jarvis is the Gorley Putt Professor of Poetry and Poetics at Cambridge University. He is the author of the poetry collections The Unconditional, Dionysus Crucified, and Night Office, and has published seminal studies of Wordsworth, Adorno, and Shakespearean criticism. Abbreviations and a Note on Translations. 1. The Dialectic of Enlightenment. 2. A Critical Theory of Society. 4. Art, Truth and Ideology. 5. Truth-Content in Music and Literature. 6. Negative Dialectic as Metacritique. 7. Constellations: Thinking the Non-identical. * A comprehensive and accessible introduction to one of the twentieth century's most original thinkers - Theodor W. Adorno. * Jarvis provides a clear, detailed and broad-ranging account of Adorno's work which includes Adorno's contributions to philosophy, social theory, aesthetics, literary criticism, and the philosophy of music. * This book demonstrates the enduring coherence of Adorno's thought and illustrates its continuing relevance to contemporary debates.